When I was an undergraduate, a friend at another college showed me the coloring book she was using for her anatomy class. Yikes! A coloring book for a college anatomy class?! Honestly, I thought the idea was ridiculous. Even though my friend swore to me that it helped her learn anatomy. But then I took a close look at that coloring book and realized that it wasn't exactly like those circus coloring books I loved as a child. These drawings were much more detailed. They included the important structures of the human body that I needed to know. Yet, it still looked like fun! 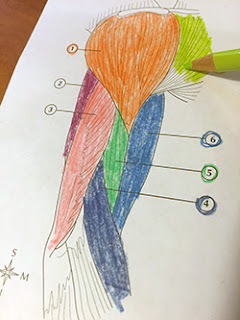 When I became an A&P teacher, I remembered that experience and looked further into coloring books as learning tools for human anatomy and physiology. Coloring an anatomical diagram is multisensory. Besides reading and spatial vision processing, your brain is also processing your kinesthetic or "muscle" senses. Therefore, you are using more parts of of your brain to process the information. And that means that you are forming more memories than when engaging fewer senses. More "copies" of these memories formed makes it easier to retrieve those memories later, when you need them. Coloring exercises take time. Therefore, doing them forces you to slow down. You can't merely skim over notes, diagrams, or text as you might when doing traditional study tasks. You have to spend time, thus making it more likely that you'll really engage meaningfully with the content. Coloring a diagram can help identify and correct misconceptions. Because you want to fill in all the available blank spaces in a drawing, you won't miss details that would have otherwise escaped your notice. Besides that, you'll be forced to see where the exact boundaries of each structure are, how they connect with other nearby structures, and where some parts may "hide" beneath other parts. Coloring is relaxing. In fact, so-called adult coloring books are now very popular for the purpose of stress relief and relaxation. They can produce an almost meditative, open mindset. When dealing with the sometimes overwhelming nature of studying A&P, doesn't a bit of relaxation sound like just thing you need? Wouldn't some coloring just before a test or exam get your mind in a better place than the anxious fretting that you might otherwise be doing? Coloring can support relationships. Coloring alongside your study buddies can be a good way to build rapport that helps learning in other ways. And you can help each other figure out tricky spots when you may not be quite sure which part should be colored—is it part of this structure or that one? But it's also good for supporting relationships with friends and family members who get to spend less time with you now that you are working so hard on your A&P class. There are many coloring books for A&P available. One I like is Mosby's Anatomy and Physiology Coloring Book. That one and others can be found at Amazon or in your school's bookstore. I also suggest keeping blank sheets of paper between the leaves of the coloring book, to prevent colors smearing—or smudging onto facing diagrams or text. An even better strategy is to remove each page before coloring it. Then, when you are finished, the colored diagram can become part of your set of notes for that topic. So yeah, coloring books for college seem silly at first. Really silly. But I can tell you that I've seen many, many students benefit from them in learning A&P! So really, they're not so silly, after all!